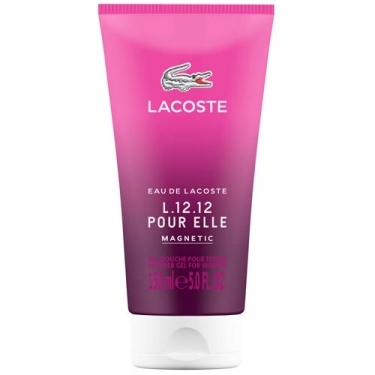 DESCRIPTION: L.12.12 Pour Elle Magnetic Shower Gel from Lacoste is a shower gel that represents the dichotomy between feminine elegance and athletic innovation. The fragrance opens gracefully with a new unique note: Pretty Lady Flower. Reminiscent of tropical fruits, the note is bright and fun, followed by a sophisticated heart of leaves of violet and jasmine, radiating a femininity effortlessly. Such as the combination of sweetness and sensuality that represent the Lacoste woman. Notes of Vanilla and Patchouli finalize the perfume with a magnetic intensity. Sophisticated yet deliciously more. A rich and sophisticated fragrance for special moments.